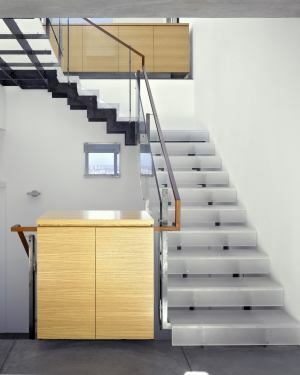 When the financial meltdown placed added constraints on the budget for this custom remodel-–which was already underway–the architects got creative. 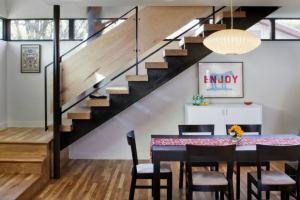 One place they saved without sacrificing good looks was in this open stairway, which connects the dining area to second floor loft space above. 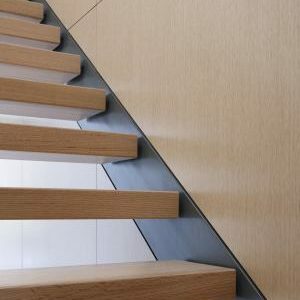 Retro in a way that matches the owners’ mid-century modern style, this stair support is made of glu-lam beams (glued laminated timber) rather than steel, with side panels fashioned out of maple plywood. 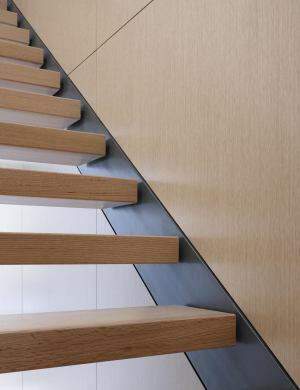 The floating horizontal treads are white oak to match the floor. Channeling daylight into this urban home was an issue, given the steep slope of its infill lot–particularly the lowest level, which is buried in the hillside. The architects also wanted to use off-site fabrication methods to shorten the build time and lower labor costs. 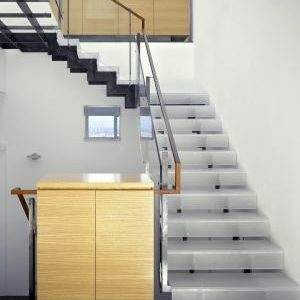 This central core staircase meets both goals with a design comprised of water jet-cut 1/2″ steel stringers, acrylic treads and risers, steel and glass guardrails, and a mahogany handrail. 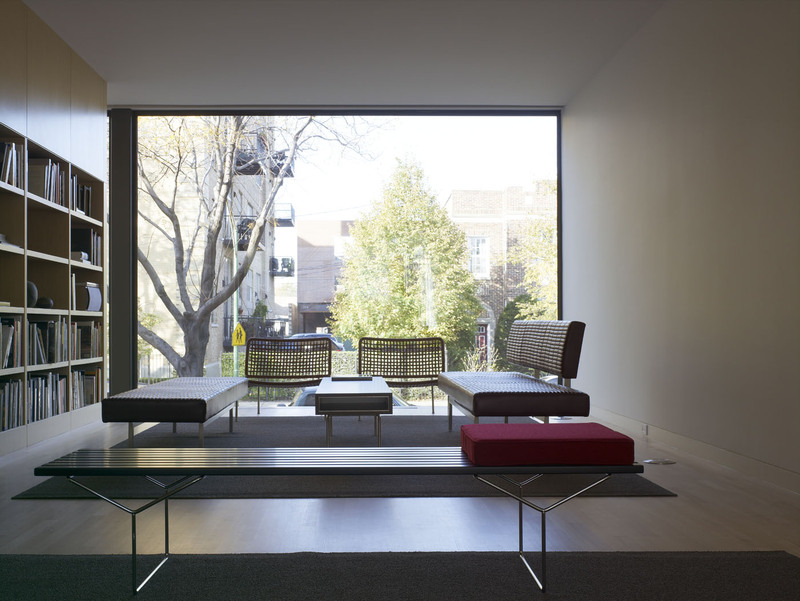 The minimalism and translucency of the structure allow sunshine from a large, operable skylight above to flood the interiors. The original rear façade of this home on the Connecticut River essentially ignored all that the waterfront site had to offer. When the clients remodeled, they wanted to change that. 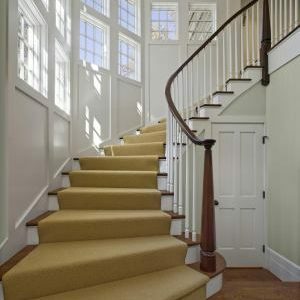 The graceful curvature of this paneled staircase is pretty in its own right, but it also reflects what is now an undulating exterior façade that follows the shoreline. 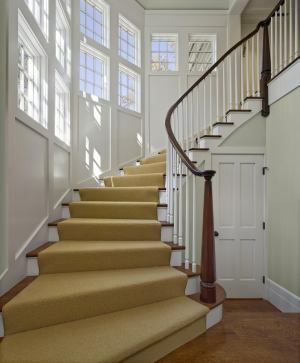 Large windows bring sunlight inside and allow views of nature from every point on the staircase.